A systemic fungicide which effectively prevents & controls major diseases on roses, flowers, lawns, trees & shrubs. Very effective when used for disease prevention or applied at the first sign of disease. Best results occur when treating early in the season. If disease is already present, this product will not eliminate it. ferti•lome® Liquid Systemic Fungicide II, when used as directed, is safe to plants and controls the diseases listed on this label. The use on plants or diseases not listed on the label may result in plant injury and poor disease control. Do not apply this product to African Violets, Begonias, Boston ferns, or Geraniums. • Use on fruits, vegetables, shrubs, trees & ornamentals. Plant diseases controlled on listed vegetables, flowers, fruits and ornamentals including but not limited to: Anthracnose, Leaf Blights, Downy Mildew, Powdery Mildew, Leaf Curl, Scab, Black Spot, Fusarium Leaf Spot, and many more diseases listed on the label. • For listed vegetable & ornamental diseases spray until the point of runoff and repeat at 7-14 day intervals. • For fruit diseases apply full coverage until the point of runoff to thoroughly cover tree canopy including undersides of leaves. NOTE: Monterey has recently changed the name of this product from Agri-Phos Systemic Fungicide. The formula is the same. You may receive product with Agri-Phos or Garden Phos on the label. •	Can be used as both preventative and curative spray. •	See Extra Information tab for label info. Click Product Datasheet. Monterey Lawn and Garden Products is a distributor of plant protection chemicals and fertilizers. We are based in Fresno, in the heart of California’s agricultural region where we first emerged in 1963 as Monterey Ag Resources. 25 years later, Monterey Lawn and Garden was established with the goal of offering home gardeners the same professional grade technology available to the ag industry. Our growing line of products provide economical and effective solutions to yard and garden problems, and are properly registered and labeled to be sold to and used by the home gardener. 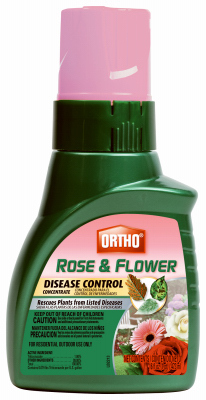 With Ortho Rose & Flower Disease Control Concentrate, you can help combat the bugs and diseases that are destroying your roses and flowers. Controls & prevents black spot, rust, powdery mildew & other listed diseases, foliar spray, starts working within hours, systemic action, can't be washed off by rain once dried, provides up to 4 weeks of control. Can be used as a dust or wettable spray on Roses, shrubs, flowers, fruits and vegetables. Provides a versatile method of controlling listed insects and diseases. As a spray: 4 tablespoons per gallon. As a dust: Apply on all plant surfaces to thoroughly cover.